Gear ratio is the ratio between the number of teeth on two gears that are meshed together, or two sprockets connected with a common roller chain, or the circumferences of two pulleys connected with a drive belt. A sprocket and roller chain. 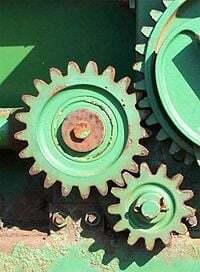 In the picture to the right, the smaller gear (known as the pinion) has 13 teeth, while the second, larger gear (known as the idler gear) has 21 teeth. The gear ratio is therefore 13/21 or 1/1.62 (also written as 1:1.62). This means that for every one revolution of the pinion, the gear has made 1/1.62, or 0.62, revolutions. In practical terms, the gear turns more slowly. Suppose the largest gear in the picture has 42 teeth, the gear ratio between the second and third gear is thus 21/42 = 1/2, and for every revolution of the smallest gear the largest gear has only turned 0.62/2 = 0.31 revolution, a total reduction of about 1:3.23. Since the intermediate (idler) gear contacts directly both the smaller and the larger gear it can be removed from the calculation, also giving a ratio of 42/13 = 3.23. In other words, the gear ratio is proportional to ratio of the gear diameters and inversely proportional to the ratio of gear speeds. Valve timing gears on a Ford Taunus V4 engine — the small gear is on the crankshaft, the larger gear is on the camshaft. The crankshaft gear has 34 teeth, the camshaft gear has 68 teeth and runs at half the crankshaft RPM. 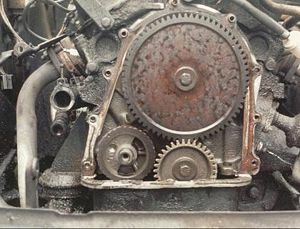 A belt with teeth, called the timing belt, is used in some internal combustion engines to exactly synchronize the movement of the camshaft with that of the crankshaft, so that the valves open and close at the top of each cylinder at exactly the right time relative to the movement of each cylinder. From the time the car is driven off the lot, to the time the belt needs replacing thousands of kilometers later, it synchronizes the two shafts exactly. A chain, called a timing chain, is used on some automobiles for this purpose, while in others, the camshaft and crankshaft are coupled directly together through meshed gears. But whichever form of drive is employed, on four-stroke engines the crankshaft/camshaft gear ratio is always 2:1, which means that for every two revolutions of the crankshaft the camshaft will rotate through one revolution. Automobile drivetrains generally have two or more areas where gearing is used: one in the transmission, which contains a number of different sets of gearing that can be changed to allow a wide range of vehicle speeds, and another at the differential, which contains one additional set of gearing that provides further mechanical advantage at the wheels. These components might be separate and connected by a driveshaft, or they might be combined into one unit called a transaxle. The car’s tires can almost be thought of as a third type of gearing. The example Corvette Z06 is equipped with 233/45-14 tires, which have a circumference of 82.1 inches. This means that for every complete revolution of the wheel, the car travels 82.1 inches. If the Corvette had larger tires, it would travel farther with each revolution of the wheel, which would be like a higher gear. If the car had smaller tires, it would be like a lower gear. A close-ratio transmission is a transmission in which there is a relatively little difference between the gear ratios of the gears. For example, a transmission with an engine shaft to drive shaft ratio of 4:1 in first gear and 2:1 in second gear would be considered wide-ratio when compared to another transmission with a ratio of 4:1 in first and 3:1 in second. This is because, for the wide-ratio first gear = 4/1 = 4, second gear = 2/1 = 2, so the transmission gear ratio = 4/2 = 2 (or 200 percent). For the close-ratio first gear = 4/1 = 4, second gear = 3/1 = 3 so the transmission gear ratio = 4/3 = 1.33 (or 133 percent), because 133 percent is less than 200 percent, the transmission with the 133 percent ratio between gears is considered close-ratio. However, not all transmissions start out with the same ratio in 1st gear or end with the same ratio in 5th gear, which makes comparing wide vs. close transmission more difficult. An intermediate gear which does not drive a shaft to perform any work is called an idler gear. Sometimes, a single idler gear is used to reverse the direction, in which case it may be referred to as a reverse idler. For instance, the typical automobile manual transmission engages reverse gear by means of inserting a reverse idler between two gears. This page was last modified on 24 May 2017, at 16:08.